In the right corner of the icon is the falcon that woke St. Francis for prayer each night on La Verna. Just as the falcon wounds its prey, so does Christ wound St. Francis. The life of Christ enfolds the mystery of death. That mystery marked the life of St. Francis, first in his heart and soul, and then on his body. It signs each person who encounters Christ in prayer. If we die with Christ, so will we rise with him. The wounding is our healing and the death is our life. 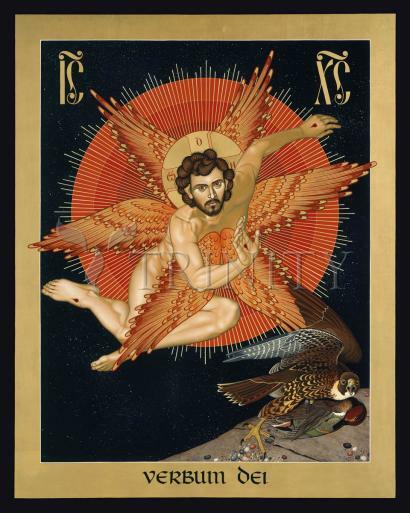 “Two years before Francis gave his soul back to heaven, while he was staying in a hermitage called ‘Alverna’ after the place where it was located, he saw in a vision from God a man with six wings like a seraph, standing above him with hands extended and feet together, affixed to a cross. Two wings were raised over his head, two were extended in flight, and two hid his entire body.